Val's Quilting Studio : Friday Night Sew-In! We are gradually thawing out in our part of the world. And now that the temperatures range from 21-41 degrees, the bunnies have been moved out of the basement and returned to their outdoor hutch. They are very happy! Life is a little less overwhelming as the snow has gradually been melting and life is becoming normal again. We can see our streets and sidewalks and yes, there is light at the end of our winter of snow! A school, the kids are able to play outside once again and we followed Valentines Day with a lesson on dental care...as after all, February is Children's Dental Health Month. I sent them eash home with new toothbrush kits I got donated, as they in return promised to brush after eating all that candy. LOL! And here I find myself with February almost over and not a stitch of sewing done. I have a four day weekend ahead, but with most of it being spent alone, as hubby has to work some long overtime shifts. (Poor guy!) So what's a girl to do? Well, I plan to ignore the water damage to my design wall and take advantage of some good sew time! I'm looking forward to, for the very first time, joining everyone else at this month's FNSI, hosted by Wendy over at Sugarlane Designs. It will be a good jump start to my long sewing weekend ahead. Click HERE to check out all our Valentine links this week. Yay! Glad to see the snow melting. How awful about your design wall. Mother Nature can sure be mean sometimes. You have a nice list of goals for the weekend. I'm so jealous you have 4 whole days to play. I vote for covering up that poor design wall with a few blocks as you enjoy your weekend! Hang a quilt over the design wall. I'm so glad you are getting back to normal. Love the idea of feeding the birds. Oh, no, poor design wall. Love the birdseed heart, but in my yard the squirrels would have trashed it in two minutes or less. Have a good long single weekend. How fun to see your classroom kids! They look like a lively bunch :) I'm glad all the small animals (humans included) are able to move around outside more now that the snow is melting. We are all tired of the snow and cold - 2 legged and 4 legged. OYI - water damage is not a fun clean-up/repair. Breath and sew. So it's beginning to thaw out a little way up there...good! You have had a time of it haven't you! Four days straight for some stitching...sounds like heaven. Love the birdies' idea. You have been snow bounded all winter. Glad there is a break and some melting going on. Love the heart for the birds....too cute. Have fun sewing this weekend! 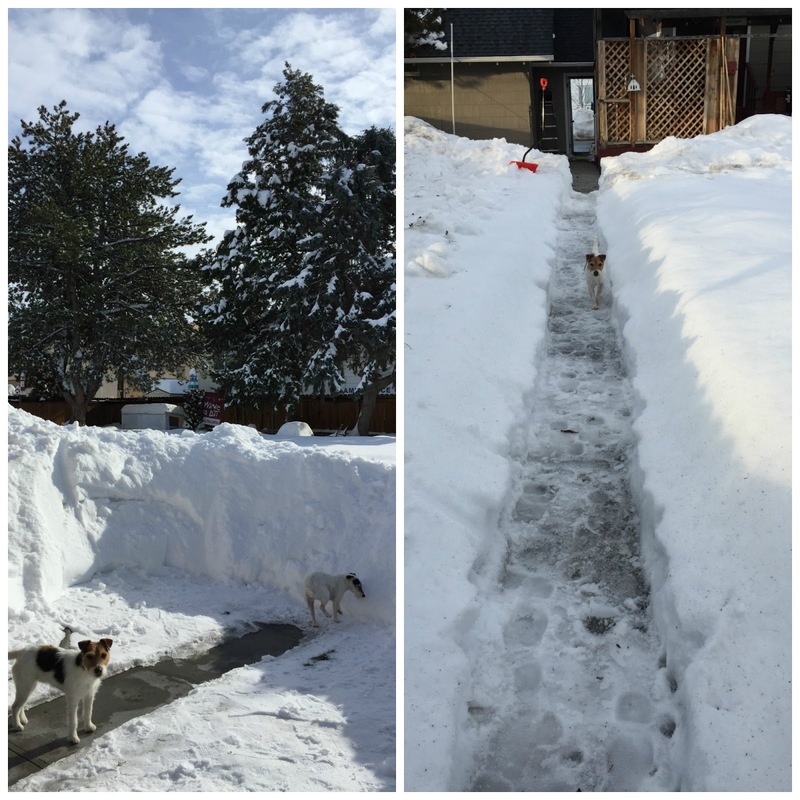 Glad you are digging out of all that snow! That was a pile of snow!!! Have fun stitching. I hope you had a successful sewing time Val! 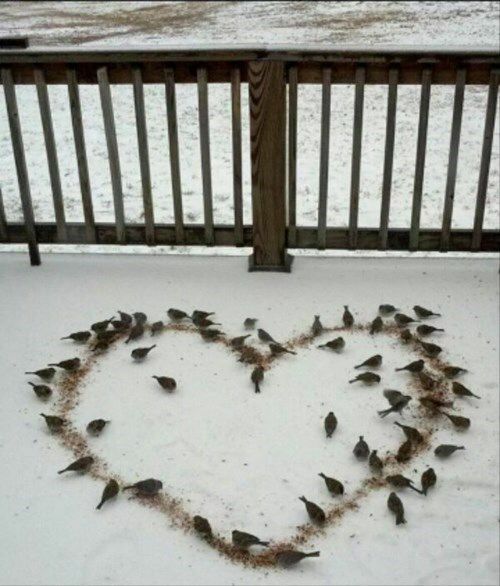 Gosh that's a lot of snow, you sound very pleased now that it is melting :-) Love the bird/heart photo, what a fun idea! Welcome to FNSI....Hope you did manage to stitch..
Glad that things are getting back to normal as far as the snow goes. The warmer temps are very welcome here too. Hope you got lots done on the stitching front last weekend.